The holiday season is upon us and it is time to find that special little something for all those people on our gift list. I know that's where my thoughts should be focused on but all I can think about is what am I going to do in 2010. My mind is on what new lines I will be working on and what will be the focus of my new blog for the new year ( if anyone has any suggestions let me know). Well, I know I need to finish 2009 first and this is one of those pieces that I want to feature before this year ends. 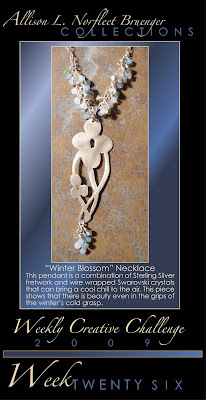 So here is my little "Winter Blossom" necklace to start off the holiday season . Enjoy!